Gem Turquoise is the quality of the stone itself. The majority of the material that most all Gemstone Mines, throughout the world, produce is low to commercial grade. When a prospector is searching for gemstone mineral deposits they will find a lot of inferior deposits of the mineral they are seeking, however, to find gem quality Turquoise or any other type of gemstone is not an easy task. Less than 1% of all Real Turquoise found is actually Gem Turquoise. Gem Turquoise has always been hard to get, but today it is definately Rare Turquoise. Gem Quality Turquoise is a fabulous Gemstone and it does not need to be altered in any way to be cut into a beautiful, hard and durable stone. It has depth and clarity in appearance and is spectacular when made into Jewelry. We call this Gem Turquoise Jewelry. Do to the metaphysical and spiritual values Turquoise is historically known for, gem quality Turquoise should be a consideration if you are purchasing Turquoise Jewelry to withstand the test of time. So, what is Gem Turquoise? my partners, and I are Turquoise miners and are impressed by your website, and we see your website as a positive vehicle for educating the public about turquoise. The first inaccuracy I noticed is that you state that, turquoise is a sedimentary stone, although it may form in sedimentary rock it is not deposited as sediment. Turquoise forms in arid environments where small volumes water do to limited rain fall peculate slowly through surface rocks allowing the mineralogical cocktail to solidify and accumulate as turquoise. The process can take place in closed systems where water is circulated back up through the rocks as well. When phosphate rich water flows through stone with a high aluminum content where there is copper present you can get turquoise, if you have the little or no copper you get variscite, if you have no copper but iron instead you get calcociderite, and if the other component is zinc and non of the above then you get faustite, and any of these minerals can have varying amounts of copper, iron, zinc, as impurities effecting such things as color, toughness, and more. The concentrates and specific proportions of the minerals determine the color and quality of the gemstone that will actually be produced, in most cases, millions of years later. The maturity of the deposit is another factor in the formation of the gemstone as time and the proper conditions harden the material to the point that it becomes agatized (according to the Mohs gemstone hardness scale,) Gem Turquoise being a 6 in hardness according to the Mohs Scale. Hopefully this helps you understand what gem Turquoise is better in regards to geology. Typically, commercial grade Turquoise used in inexpensive Jewelry does not meet the Mohs standard and often will test at less than 2 in hardness, which is about as soft as your fingernail. This is simply young Turquoise that has not aged, it has the mineral ingredients to be classified as Turquoise, but, it is still in the state of chaulk consistency. In this case, the industry standard has been stabilizing the poor quality Turquoise by injecting it with plastic resins. At this point the stone is no longer natural nor a gemstone. 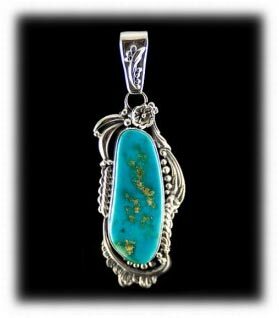 Durango Silver Company deals in quality Gem Turquoise Jewelry and has a historic record of collecting and mining the best gem quality American Turquoise that has come out of the ground, past and present. We also carry gem Turquoise from other parts of the world that meets our standards. 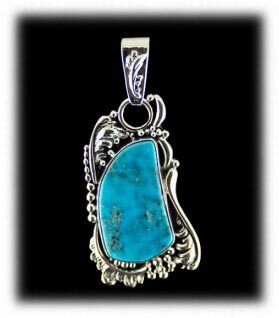 If you are interested in quality authentic Turquoise Jewelry, consider Durango Silver Company as we have been in the business for nearly forty years and are known for the best! 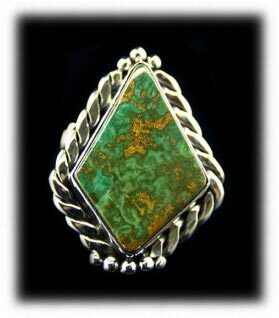 The Hartman family, owners of Durango Silver Company, is located in Durango Colorado and have been using Gem Turquoise from the American Southwest in our Jewelry since the early 1970's. 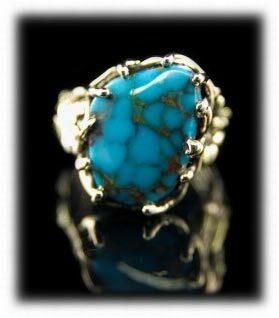 We have a deep respect for Natural Turquoise and especially of gem quality. 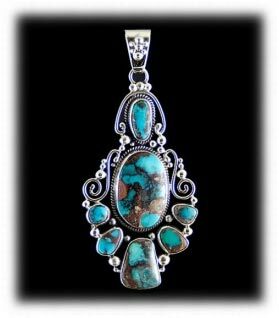 We also use high quality natural Turquoise all over the world, but we have a special love for Gem Turquoise from the American Southwest. 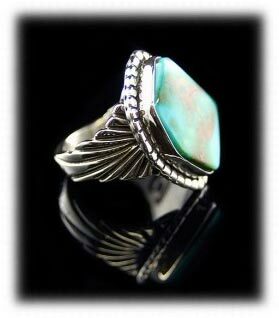 We specialize in making Southwest Style Sterling Silver jewelry that is substantial weight and of unquestionable quality. We use high grade to quality gem Turquoise from known American Turquoise mines such as; Bisbee, Blue Gem, Blue Diamond, Blue Wind, Carico Lake, Cerrillos, Kingman, Manassa, Morenci, Orvil Jack, Pilot Mountain, Royston, Sleeping Beauty & the Tortoise Turquoise Mines. We physically cut most of the Turquoise Stones used in our Jewelry and have also mined or purchased the raw Turquoise directly from the owners of the Turquoise Mines it came from. If you are the type of person that appreciates quality Jewelry and are interested in High Grade Turquoise Jewelry, take a look at what we have to offer. We specialize in silver jewelry with Gem Turquoise. Please be our guest in surfing our website where you will find a wealth of factual information that has been thoughtfully written for your knowledge and enjoyment. 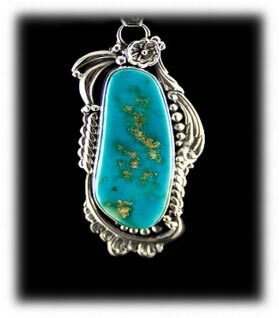 This Bisbee Turquoise Pendant shown above was made with gem quality Turquoise from the most famous mine in America. The Bisbee mine in southern Arizona is extremely mineral rich and Turquoise is just one of the fabulous minerals this mine produced. This is good example of Gem Turquoise Jewelry. 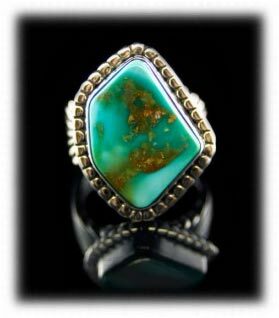 Bisbee Turquoise is one of our specialties as we have one of the largest collections of Bisbee Turquoise in the world. This Blue Gem Turquoise Pendant above has a wonderful gem quality Turquoise stone from the Blue Gem Turquoise Mine which was located near Battle Mountain Nevada USA. The deep rich blue is complemented by accents of green which makes this gem quality Turquoise Pendant a knockout! We consider the silverwork of a Victorian style and this pendant was made by John Hartman of Durango Silver Company. Above are two beautiful Turquoise Pendants with gem Turquoise. The piece on the left has spiderwebbed Turquoise from the Blue Wind Turquoise Mine located in Lander County, Nevada. The Pendant on the right has Victorian style silverwork complemented by a fabulous Morenci Turquoise Gemstone. Jewelry of this quality is one of a kind and irreplaceable. 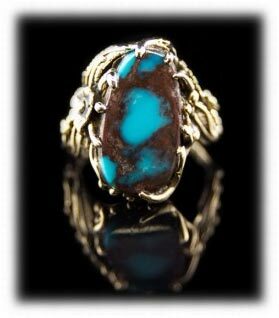 This Gold and Silver combination Mens Turquoise Ring has an exceptional Dry Creek Turquoise Stone from Nevada. This spiderwebbed Dry Creek Turquoise stone is light in color but of gem Turquoise quality as it is very hard and lustrous. The silver and gold work was designed to complement the fine quality piece of Turquoise. 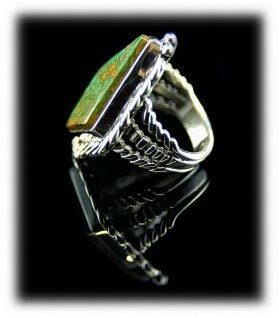 The Mens Turquoise Ring above is of a heavy Southwestern Silver design with exquisite silverwork next to the stone as well as having a fancy ring shank. The gem quality Manassa Turquoise is from one of the first Turquoise Mines that was originally found by the Native American Indians over 1000 years ago. Manassa Turquoise is one of our specialties as the King family (mine owners0 have been personal friends of ours for over 30 years. We specialize in gem Turquoise from the Manassa Turquoise mine. 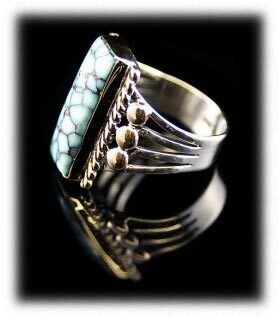 This is a fascinating Womens Turquoise Ring of classic Southwestern design and with a Tonopah Blue Gem Turquoise beauty. The Tonopah Blue Gem Mine was a high producer of fine quality gem Turquoise in the 1950's through the 60's. 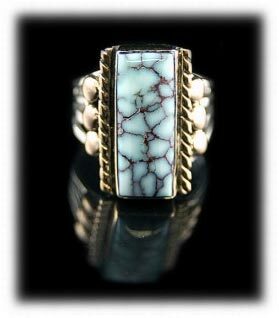 This gem Turquoise Ring is a great example of collectors grade Southwest Silver Jewelry that will worn and collected thought many generations of a family. Above are two fabulous 14K Gold, Lost Wax Style, Mens Turquoise Rings. The Ring on the left has a wonderful Bisbee Turquoise stone complemented by flowing gold surrounding the Gemstone. The Ring on the right has a fantastic gem grade stone from the Villa Grove Mine of Colorado, USA. The Villa Grove Turquoise Mined produced fine quality Turquoise in the 1950's until the early 80's. Both of these Rings were made by John Hartman of Durango Silver Company in Durango Colorado. 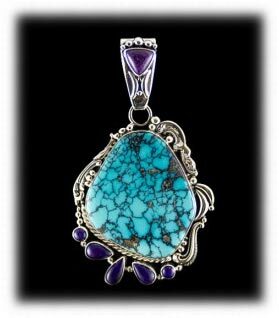 We invite you to view more of our gem quality Turquoise Jewelry here on our website. 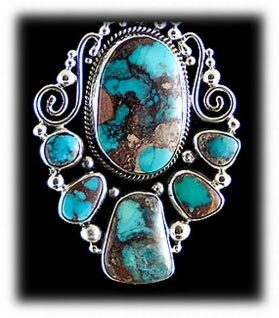 We have many great pages of educational information related to Turquoise and Turquoise Jewelry if you are interested, please follow the links within our site to read pages and view photos of your desire. If you have any questions or concerns, please feel free to contact us. Thank you for reading our brief page about Gem Turquoise.